I’m not usually drawn to pastel-coloured flowers and I’m not a huge fan of yellow ones but I discovered these yellow tulips in the bluebell patch at the bottom of the garden, and big clumps of primroses down there are still flowering their socks off. The blue/violet and yellow seemed a little lacking on their own, so I added a couple of sprigs of a pink scented pelargonium that have been flowering for a couple of weeks now in another vase. There’s a heavy blanket of cloud sitting over East Kent today (it feels like it could start bucketing down at any moment) and low light levels, so even in my usually bright kitchen photographing the vase was tricky and I hope I’ve captured the delicate colours. As usual, I’m joining in with Cathy at Rambling in the Garden (who has sweet peas today!) where you’ll find links to loads of lovely vases from around the world. Hope the weather is calm, mild and sunny for you on the wedding day. Fingers crossed. Thnaks Sam – the forecast is now a bit more settled until early afternoon on Saturday (wedding is at 12). It is not a long dress so she won’t risk dangling it in puddles! 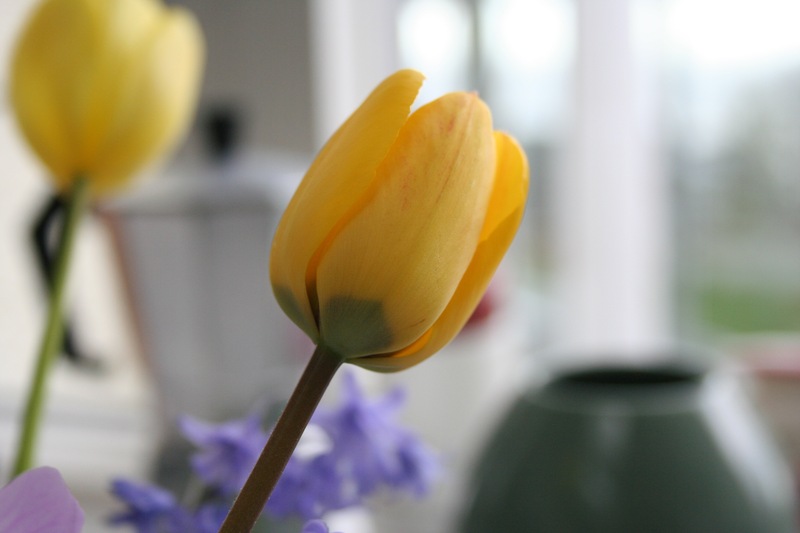 I absolutely love the spring colors in your vase that brighten up the grey day…especially those yellow tulips. Perfect spring colours, the lighting looks perfect for them. 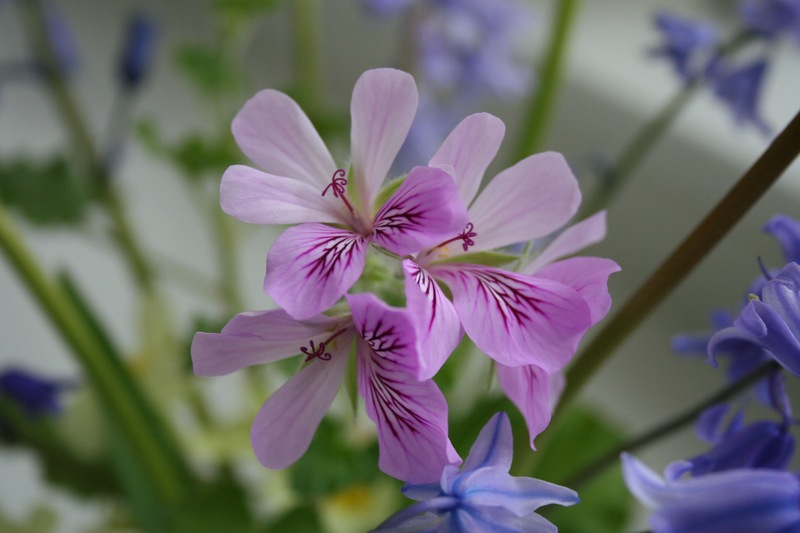 Lovely choice of light colours, especially with the addition of the pelargonium flowers. I have a patch of yellow tulips in the border that I swear I will remove every year, but it is still there! The colors brighten a gray day beautifully, Sam! If you’re not a fan of yellow, I’m afraid my vase this week is likely to give you a fright. I know what you mean about yellow too. I either like it pale and primrosy or acid and euphorbic! May have made a new word there – hope you know what I mean! 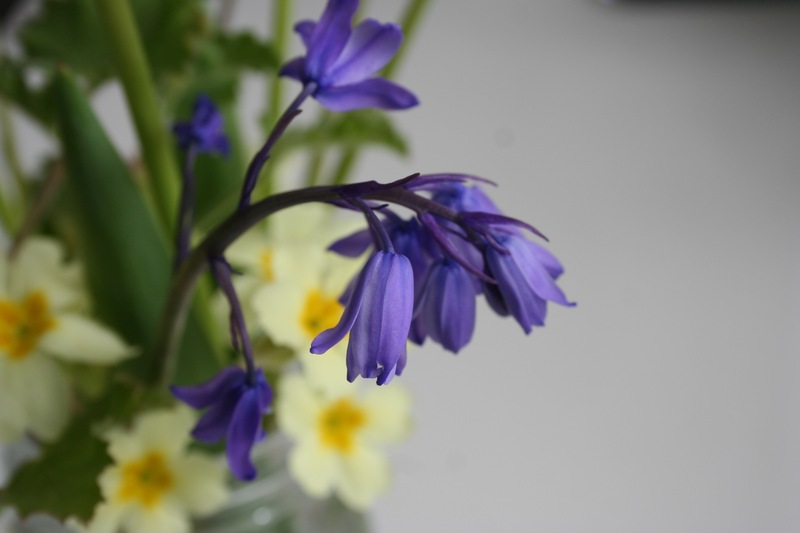 How lovely to have a bluebell patch. 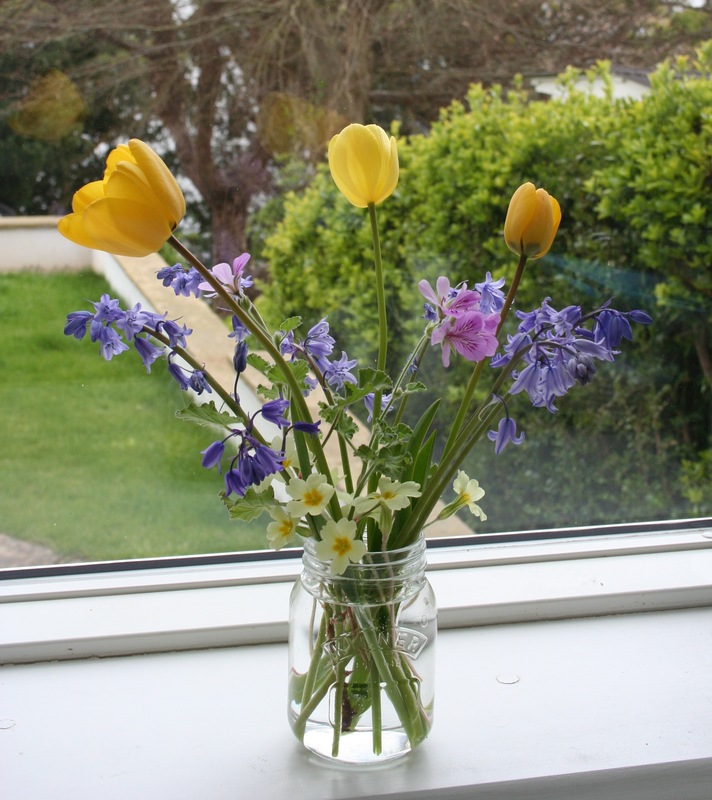 Your photos are never grey and gloomy and your vase is just right for today with its delicate scent of Spring. Euphorbic should be a word. Brilliant. Yes, it’s a scented one (can’t remember the name). The vase smells lovely. Blue and yellow – sunny blue skies. I have blue kingfisher and yellow climbing Senecio daisies paired outside the kitchen door – makes me happy each time I see it. Your vases are so beautifully simple and cheerful! Love them! The peach-tinted tulips look so pretty with all the tubular purple flowers, I especially like the view from the top, Sam. I have a lot of the purple flowers springing up in my yard, they last a long time in a vase. The pelargonium has such pretty patterns on its petals. Geraniums already! Your garden is weeks ahead of mine. Thanks for what I am hoping is a window to my future! Ahhh, refreshing blogger honesty there…thanks for that! I’m all for revealing the smoke and mirrors (my photos are artfully cropped!). I don’t know what it is about them. Maybe I’ll mellow. 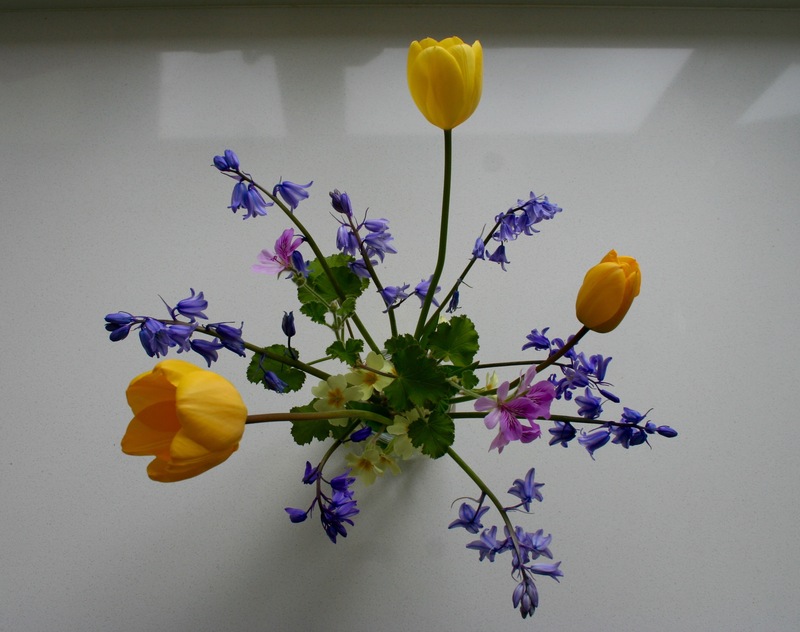 The yellows go well with the blues don’t they, especially at this time of year! I knew from the title that I was going to love this arrangement, and sure enough it is my favorite so far. I’ve only just stumbled onto your blog, but this is such a simple yet lovely idea.